With a good understanding of the existing site conditions, the blast design process can begin. Blasting professionals determine how the explosives will be applied to the rock to be blasted. The goal is to distribute the explosives throughout the rock mass such that the rock breakage achieves the desired result, is easily movable by the excavation equipment and generates minimal adverse environmental effects. The blast hole diameter is often selected based on the depth of the excavation. Shallow excavations generally use smaller diameter holes than deeper excavations. Diameter of the blast hole. Once the diameter of the hole and the explosives type have been selected, the next step is to determine the layout of the holes – the blast hole pattern. With the proper layout, the explosives energy can be optimized to break the rock. To distribute the explosives throughout the rock mass, holes are drilled in the rock in a grid-like pattern. The distance between the holes is critical. Each blast hole is intended to break the rock beside the hole, towards the open excavation. Regardless of the type of explosive used, there is only a finite amount of energy available to break the rock. If the holes are too far apart, the energy will not be sufficient to generate the desired breakage. On the other hand, if the holes are too close together, energy will be wasted. Another important part of the blast hole pattern is the number of holes. This number is largely dependent upon how much material needs to be excavated by each blast. Also, the pattern will tend to be matched to the equipment available to excavate the broken material. While a blast may feel and sound as though all the holes go off at once, in reality each hole detonates separately, just a few milliseconds apart (1 millisecond equals 1/1000th of a second). This allows the blast holes closest to the open excavation to detonate and move rock into the open space first. Then the blast holes behind the first holes can move rock horizontally into the new open space. 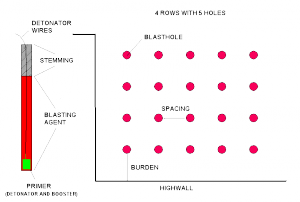 The blasting professional accomplishes this timing between holes by the use of detonators or blasting caps. Each blasting cap contains a timing element that controls the firing time. The timing sequence in the blast is created by using specialized detonators that either have specific timing built into them or are programmed to detonate at the intended time. Improved Rock Breakage – The timing sequence can be designed to control how the rock moves and the size of the broken rock. Controlling Offsite Effects – Separating the detonations also helps to minimize ground vibration and air overpressure. These are some of the basic design elements from the planning phase of a blast. With carefully calculated and well designed plans in hand, the blasting professional is ready to implement a blast.